At some point recently, you’ve looked at your spouse and said, “I really think Susie needs help at school. Do we need to get her tested or something?” And you know the school can do some testing and will have to in order to provide her with any special help. Maybe you’ve already requested they look at her or maybe you’re trying to figure how to make that first request. As you start to dig into the process and figure out what you need to do, it will feel overwhelming. I know. I was there 3 years ago. And initially, I thought I was doing enough by talking to the principal and teachers, asking a bunch of questions and then trusting the school to guide me the rest of the way. Yeah. As I discovered, that plan doesn’t really work out in your child’s favor. But that’s the goal here, right? To get your child what they need to be successful in school – academically, socially, and behaviorally. There are three basic areas you’ll need to pay some attention to in order to get started on your IEP journey. 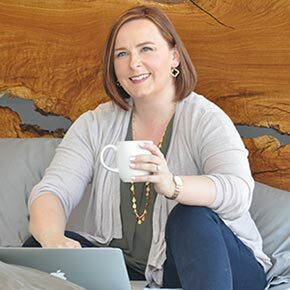 While this post will give you the Cliff Notes version of each area, I go much more in-depth into each area and provide you with specific actions to take around each (exactly what I have done or would tell my best friend to do) in my free Guide to Preparing for IEP Meetings. This tool will get you fully prepared to walk into that first meeting with the school – what to bring, what to talk about while you’re there, and what information you should have from the school when you leave. It’s what I wish I had been given when I started out and I hope you’ll find it useful! 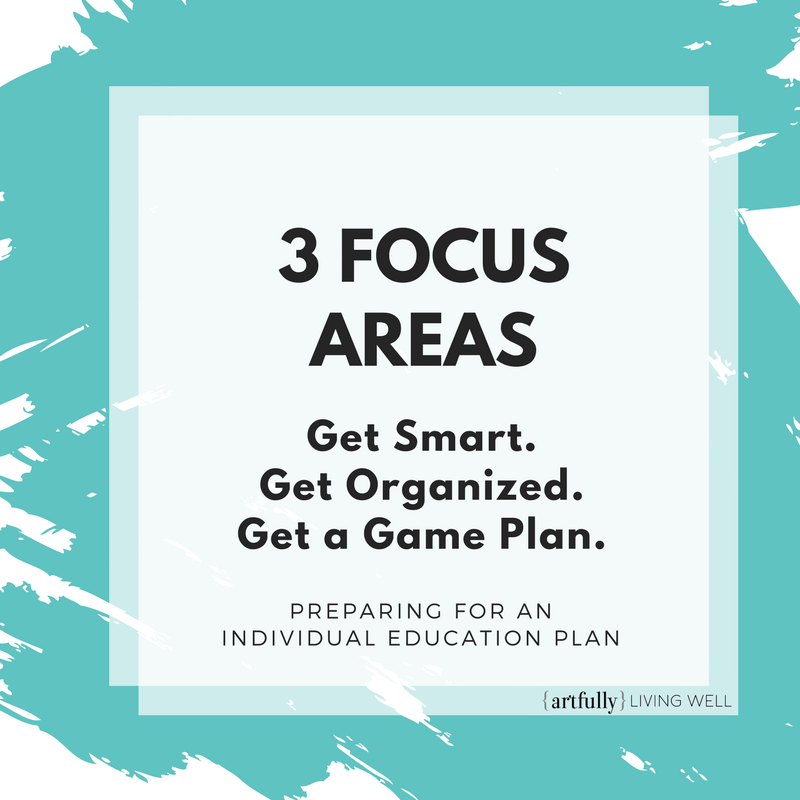 The three main areas of focus for your IEP Preparation should be: Get Smart, Get Organized, and Get a Game Plan. Getting Smart has two pieces to it: book smarts and local knowledge. You’ll need both in order to be the best advocate you can be for your kiddo. For book smarts, start with the Special Education “bible” Wrightslaw: From Emotions to Advocacy: The Special Education Survival Guide by Peter and Pamela Wright. This book is dense, but will provide you with the high-level information about what your child is entitled to under the federal law “Individuals with Disabilities Education Act” (IDEA) as well as guide you through the IEP process and provide some form letters to use as templates. This is your set of training wheels. Now, for the local knowledge — there is a myriad of sources you can turn to — but my #1 suggestion is to find someone who is 2 steps further down the road. I know, I know. Having a child who has special needs (especially if they’re not obvious physical ones) still has as much stigma wrapped around it as other mental health issues. But you’ve gotta talk about it if you want the help and guidance that comes from finding an awesome support network. You need someone who can hold your hand as you cry angry, frustrated tears and who will help you navigate your local school & district process. Someone who knows the ins and outs and can provide gentle course corrections to keep you on the right path. 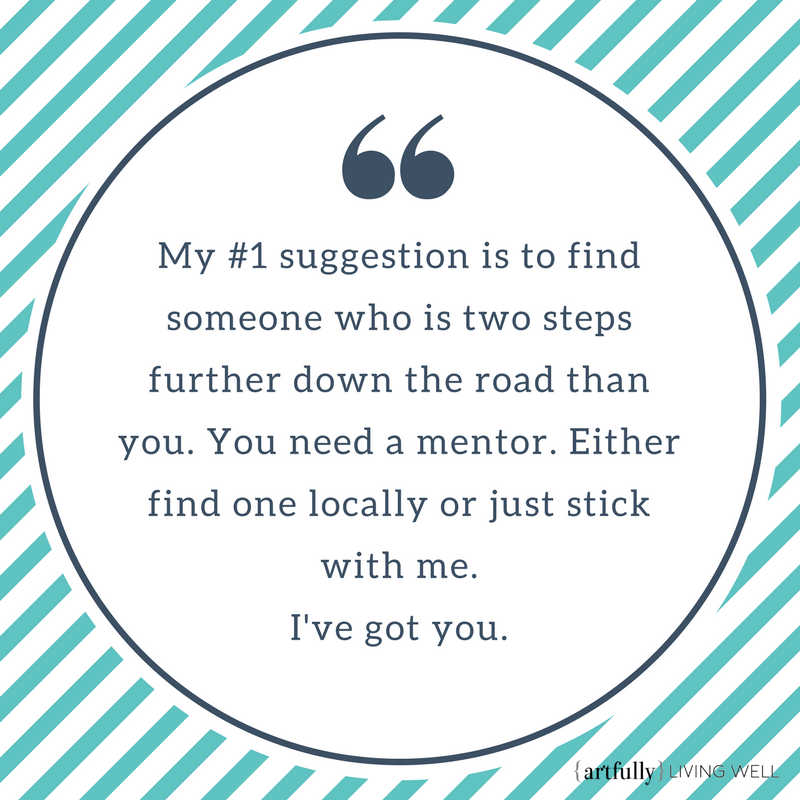 If you don’t personally know of anyone who can step in as a mentor, don’t be afraid to ask the school district about resources that are available. Some will simply have some pamphlets and larger districts may have a Parents Network they can connect you with, a resource center dedicated to helping parents and the community and host classes or seminars on the various topics of interest for families of special needs children. Just PLEASE don’t hesitate to ask – you need this information and support NOW, not later when you already have an IEP that isn’t working for your child, but you’re so far down a path and the school is resistant to changing it. Getting plugged in and smart at the beginning is critical – do not skip or skimp on this step! Getting Organized is an important step to take at the beginning of this journey. It’s so important that I will have several future posts, as well as some tools and templates, dedicated to the best ways (in my humble opinion) to organize all the information you’ll need to have at your fingertips. I go into a ton of detail on WHAT you should keep organized and give you an overview of two different ways of HOW I’ve done it HERE, so click through for more information. At a high level though, you should be keeping track of all communication with the school – verbal, email, and formal letters. You should have all diagnosis reports, the results of any testing which has been done outside the school and a comprehensive list of medications pulled together. And you should compile any documentation you have that supports your concerns: report cards, results from any academic testing that demonstrates your child is either failing or starting to fall behind their peers (even if they are showing progress…if their RATE of progress is slower than their peers this is a valid reason for concern. Don’t let the school tell you otherwise! ), and any samples of school work which help you underline the point you’re trying to make. Regardless of how you decide to get organized (again – more on that here in my free Guide) having all this information available at a moments notice does a couple of things for you. One, it will help you sleep at night, Mama. When you know you’ve got what you need readily available, you’re taking a huge stressor off your rather full plate. You know you won’t be caught off-guard or misspeak because you’re got it all, right there. Two, showing up to the first meeting with a tabbed binder sends a message to the school loud and clear. You mean business. You’re telling them you’ve done your homework and you can’t be tricked into being happy with less than the full extent of what your child needs and deserves. And three, it allows you to spend your time working with the team around the table, not digging for information in a huge pile of papers or even worse, delaying the whole process because you missed bringing a critical document altogether. The last area I want you to focus on is Getting a Game Plan in place. For right now, just focus on this first meeting with the school. It should be called something like an “Eligibility Meeting” or a “Domain Meeting.” Regardless of the name your local school district gives it, the purpose is the same: to determine if testing needs to be done and if so, which tests. First, fill out the Parent Organizer: Eligibility Meeting worksheet I provide HERE. This document will walk you through the main questions asked by the school during this meeting and also help you understand what kind of information you should have received by the end of this first meeting. Print it out, fill it out, and take it with you to scribble all your notes on during the meeting. Second, as you’re filling out your Parent Organizer, think for a minute about the other documentation you’ll need to have handy. 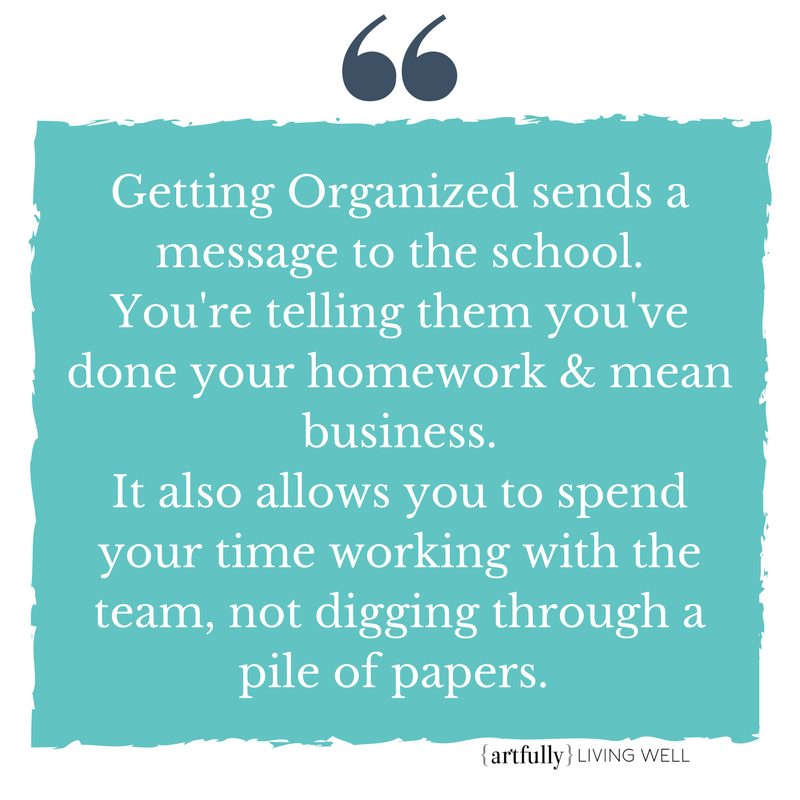 Hopefully, you’ve pulled all this together already as part of Getting Organized, but with the purpose of this particular meeting in mind, think about what specifically you need to have easy access to: do you need to summarize the 85 emails you’ve traded with the classroom teacher? Get a letter explaining a medical diagnosis from a doctor? Finally write down all the medications Jane is taking? Do all those things NOW before the first meeting. Information is power — so do your research. Know the purpose of every meeting you walk into and have your goal fixed firmly in your mind. Think about how and why the school might disagree with you and how you have evidence that leads you to a different conclusion. Be organized and have all the information you need handy. Remember, this serves two purposes: it will not only provide you with peace of mind, but it will also send a very clear message to the school. You’re ready to do business and they won’t be able to simply pat you on the head and send you on your way. Show respect and gratitude and demonstrate that you are truly a team player early in the relationship. Be on time for meetings. Dress professionally. 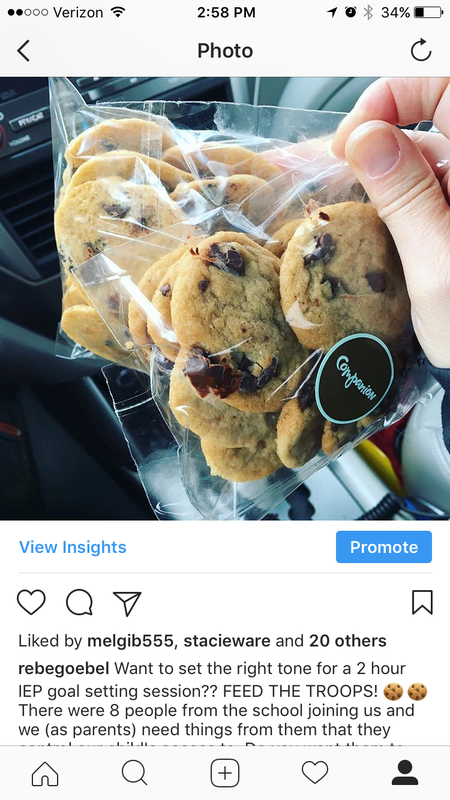 Bring donuts in the morning and cookies in the afternoon for long meetings. People who feel respected and appreciated – especially those who have full bellies or some sugar in their systems – are more likely to go the extra mile for your child. Contrast that with the parents who don’t show up on time, only half listen while they’re on their phone checking emails from work, and bark orders or rudely disagree with the team without being able to back up their position — which set of parents will the team WANT to work with? Which child is going to get the BEST services available? Both children may end up with support, but I guarantee if you show the school how much you appreciate them you have a much better chance of success. Which means your child has a much better chance of getting exactly what he needs…which is the whole point, right? Mama, if my best friend came to me today and asked, “How do I do this? How do I get started? What do I do first?” This is exactly the advice I’d give her. Get Smart. Get Organized. Get a Game Plan. And I would tell her exactly the same thing I’ll tell you — whether I know you or not — I’ve got your back, sister. I’ve been down the path and left lanterns along the way for you to follow, but if you need me, just call. I’ll come back for you and we’ll walk together.